The story of those lucky resurrected heroes continues in Brightest Day #3 and #4, which starts off with Deadman facing off against the Anti-Monitor. 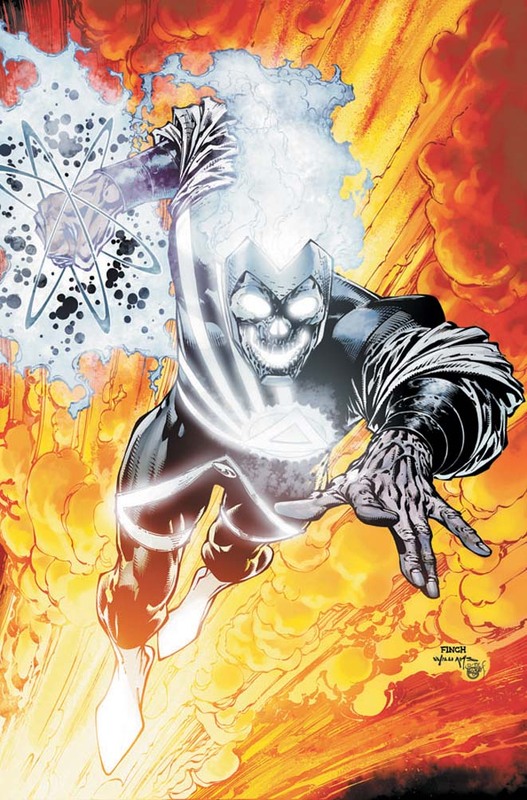 The ring creates white constructs of all the revived heroes (minus him) to attack the Anti-Monitor, but the ring claims that they were not brought back to stop the Anti-Monitor. When the Anti-Monitor attacks back, Deadman realizes that the point was that he has to try to stay alive, and the ring creates a safety net as he falls. Ronnie Raymond and Jason Rusch wake up in separate beds, and it seems that the explosion from their separation created a bunch of table salt. Jason’s dad wants Jason back home, but he convinces him to let him stay at school. Ronnie still acts annoyed that everyone’s blaming him for what Black Lantern Firestorm did, but in fact, he remembers everything. As he leaves, Jason’s father threatens him to stay away from his son. Aquaman tries to summon sea life, and he summons a dead orca. He refuses to go back to Atlantis, and Mera tells him that although she once abandoned him like an Atlantean, she will not do so now. Martian Manhunter finds the dead bodies of the family, then examines the memories of the family dog to find out about what seems to be the other Martian creature Dr. Erdel summoned. The White Lantern starts blinking, and a blue bolt of lightning hits a plane. Hawkman and Hawkgirl fight their way to Hath-Set, but Hath-Set escapes as Khufu and Chay-Ara’s bodies start to crackle with purple energy. Hawkman and Hawkgirl then find a gate made of all of their bodies from their former lives, the very gate Hath-Set escaped into. Hawkman wants to pursue, but Hawkgirl wants to destroy it and get on with their lives. However, Hawkman’s opinion prevails, and they go in, feeling the pain of all their deaths, to find a strange world with floating rocks. Deadman appears next in Dove’s apartment, and Dove can somehow see him. As they start talking, Hawk bursts in to attack him, though Dove manages to calm him down. When Deadman tells them about what his ring can do, Hawk says he has something for Deadman to do. Elsewhere, someone named Jackson Hyde is going somewhere with his girlfriend. But when she tries to jump into what is supposed to be a lake or river, the lake has dried up. The Coast Guard finds people from the damaged plane dead in the water, and they’re suddenly attacked by an army coming out of the water. Ronnie suddenly gets visited and attacked by a salt apparition of Gehenna, which quickly vaporizes. Elsewhere, the Firestorm Matrix is floating over Jason’s head. Hawk brings Deadman and Dove to the grave of the original Dove and tells Deadman to bring back his brother. Okay, so now things are getting a little slower with every plot save only the Hawkman/Hawkgirl plot. We’ve gotten past the excitement of the first revelations, and we’re getting into the meat of the main series. Unfortunately, it looks like, because of the format of the series, there isn’t enough room to keep every plotline spinning and exciting all the time. That’s to be expected, but it does reveal a bit of a weakness in the format choice. Hawkman and Hawkgirl seem to have gone to Hawkworld, and this is somehow going to relate to all the retcons and reboots they’ve gone through over the years. I’m not sure how smart it is to try to fix their complicated history by actually looking at all of the strands, but perhaps Geoff Johns and Peter Tomasi have a clear plan with that. With Aquaman, everything’s about his isolation from his home and the weirdness of the Black Lantern leftovers. That’s interesting, but I’d like to see him face off against one of his old rogues, like Black Manta. And who’s the woman with the army? I’m not sure. Deadman’s story is the most cryptic, since we still don’t know why he still has a white ring. Apparently some of it has to do with getting him to remember how to live, but again, that’s still really cryptic. The Firestorm story is just creepy, since it indicates that not only does Ronnie remember everything he’s done, but some part of him or some specter is haunting him for what he did. And it seems like it may be Jason’s subconscious anger towards him. The Martian Manhunter story is interesting, but I’d like to see him actually get to meeting this Martian monster. Then we’ve got Hawk and Dove. I’m curious as to why Hawk would want his brother back, considering his personality, but maybe he really did love his brother. I know Deadman’s efforts won’t succeed, but it’ll be interesting to see how Hawk reacts. Ivan Reis does his typically superb work, as does Patrick Gleason. Ardian Syaf continues to improve, and I still like Scott Clark’s rougher style for the Firestorm story. So I don’t really have any artistic complaints. I just feel like each of these characters deserves their own book, and that because of the format of Brightest Day, there’s a limitation to how much their stories can be advanced in each issue. The result? Stuff goes slowly.